Depression-era populists invoked the Boston Tea Party as a rallying cry against corporate greed. Here, Thomas Frank (What’s the Matter With Kansas?) lays out with biting wit how today’s conservatives co-opted that symbol and forged a pseudopopulist front to defend the enablers of market failure. The enemy of the 99 percent, he contends, is more the intellectual than the robber baron. 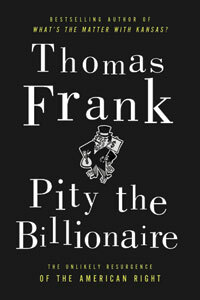 “Erasing class distinctions,” Frank writes, “is one of the conservative revival’s great recurring techniques.” Perhaps the Occupy movement is his unmentioned antidote, and his timely book a guide to help real populists elude their saboteurs.